Tiger Wheel & Tyre has a world-class network of fitment centres across Southern Africa, offering a range of top-quality branded tyres, wheels and automotive batteries at affordable prices. As a Tiger Wheel & Tyre customer, you can expect prompt service from the team of highly trained and enthusiastic staff members eager to deliver the highest calibre service and expertise in the industry. If you don't have enough rewards points to pay for your purchase in full, you can use your Standard Bank Credit, Cheque or Debit Card to pay the difference. 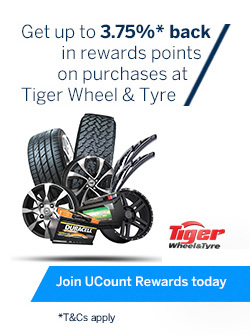 You can collect a maximum of 1500 rewards points (R150) per transaction at Tiger Wheel & Tyre. Your rewards points cannot be refunded back into your Business Rewards Card if you return goods that were purchased with your rewards points – you will be refunded with a Tiger Wheel & Tyre gift card or according to Tiger Wheel & Tyre’s return policy. Rewards points can only be redeemed at South African Tiger Wheel and Tyre stores.